Judging underway during the 2018 Bridge Building Competition. Ready, Set, Build: Central Iowa’s Bridge Building Challenge continues to grow. 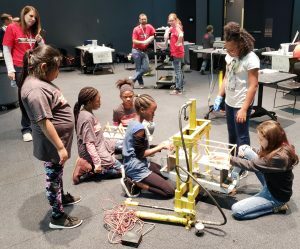 In its fourth year, the event held at the Science Center of Iowa in Des Moines expanded to a third day to accommodate interest in the challenge. Students throughout central Iowa participate in the 2018 Bridge Building Competition by testing their bridge construction before judging. More than 180 students from schools throughout Iowa formed 50 teams to compete against each other in building the best bridge using popsicle sticks, masking tape, hot glue, string, and other provided materials. The event this year was held Nov. 1–3. The students were divided into categories by grade: 4th–6th and 7th–8th grades. Each team could talk with engineering professionals from the Institute for Transportation (InTrans) and the Iowa Department of Transportation (DOT) about their projects. 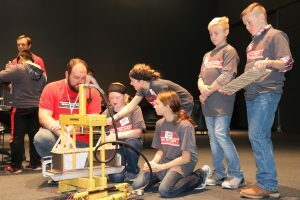 The goal of the event is to introduce Iowa students and families to the complex world of engineering and bridge design while educating them on how to effectively work in teams. The students had 2.5 hours to put together a bridge that would carry traffic, and fit within specifications to be tested. After lunch — and a chance to explore the science center — the bridges were tested on their strength and weight. Students throughout central Iowa participate in the 2018 Bridge Building Competition by getting guidance from a volunteer on their bridge. There was near-silence in the room as the bridges were tested for strength, students on edge as they waited to hear the snap of the popsicle sticks and how much weight the structure held. In the end, students were given awards for the highest structural efficiency, most innovative bridge, and teamwork. Special awards were also given for the overall winner, best adult team, and best team name. First-graders from West Marshall Elementary School also visited the event on Friday to speak with engineers, observe the older students building, and view the testing. Over 20 volunteers from InTrans and Iowa DOT aided in the success of the event.